Neurofeedback is a direct form of brain training that uses brainwave biofeedback to actually change your brainwaves permanently. It dramatically improves how well your brain and nervous system self-regulate by telling the brain exactly what you want it to do without the guessing and years of practice using traditional mind body and meditation techniques alone. It is also an effective tool for peak mental + physical performance and is used by olympic athletes, professional sportsman, top CEOS and creatives to help them perform better in their chosen fields and overcome barriers to success in specific areas relating to how their brain talks to their bodies. 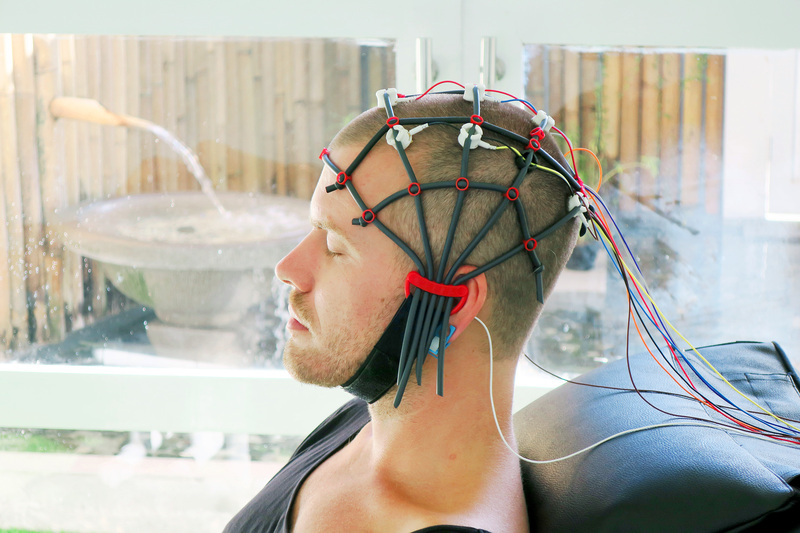 During a neurofeedback session, sensors placed on your scalp detect your brainwaves to see your brain in action. A computer compares your brainwave activity to desirable brainwave activity or specific goals decided before the session. Audio feedback sounds and visual feedback images tell your brain immediately when your brainwaves are reaching the desired goal and when they are not. It knows when you are activating or suppressing the target area of the brain. With audio feedback, you hear a pleasant reward sound when your brain is reaching the desired goal. The brain naturally wants to do the right thing to get the reward, because it wants to hear the pleasant sound. Using this method you learn how to quiet brainwaves associated with low performance and increase brainwaves associated with optimal brain function. For example, alpha brainwaves are associated with relaxation and calmness. A deficit of alpha brainwave activity is often found in alcohol addiction.. Drinking alcohol increases alpha brainwave activity temporarily. Low alpha brainwave activity is also often found in people who find it hard to relax and switch off or are always ‘go go go’. With both of these types of clients, when their alpha brainwaves increase, they receive a pleasant audio feedback sound or a visual feedback image. The brainwaves are constantly fluctuating up and down every second, so the alpha brainwaves are constantly going up and down. During a 30 minutes session, the brain would receive on average a reward signal 20-30 times a minute, so receiving up to 900 ‘reward’ cues in a session. With this constant reinforcement, over a number of session, the brain gradually learns to increase and maintain an increased level of alpha brainwaves all on its own, leading to enhanced calmness, relaxation, and in the case of alcoholics, less drive to drink. Just like gym workouts and strength training to develop specific muscles, the more your brain is trained towards a new more desirable, more regulated and more flexible state the better you feel and the quicker you can overcome health challenges and enhance peak performer traits. The need to address brain dysfunction and nervous system dysregulation for most chronic health issues and body symptoms that have no pill cure is now widely accepted. This research has led to meditation being recommended for most of these issues, but the problem is it takes months and years to see results and doesn’t work for everyone. Neurofeedback helps regulate the nervous system and brain dramatically more effectively and specifically than any other mindbody approach, drug or supplement in a fraction of the time, with lasting effects long after the final session. In 2012 neurofeedback was rated level 1 ‘best practice’ intervention for ADHD by the American Paediatric Association. It’s used in professional football, by Olympic athletes, and widely used for health, well-being, personal development and peak mental performance. NASA uses neurofeedback to train its astronauts. The US military use it to train their Special Forces. All clients and brains are different, however Improvements in sleep, energy levels and overall sense of wellbeing are often seen as early as 5-10 sessions. Generally 30 sessions is considered a full training program but the more session trained the more deeply engrained the new patterns become in the brain, which is why we prefer home training for unlimited sessions. The improvements are considered permanent. Results of 10-year, follow-up studies by Lubar (1995) found that about 80% showed improvement in the symptoms of ADD / ADHD and these changes were maintained. Your brain is capable of something called neurogenesis which is the ability to form new brain cells. Neuroplasticity is the brain’s ability to learn and change constantly and retain that learning. When we train the brain out of dysfunctional patterns into more desirable patterns, the brain finds it has to expend less energy to stay in these new patterns so it becomes the new normal. It is similar to a car spinning its wheels in the mud. A dysfunctional brain expends a lot more energy + resources trying to maintain homeostasis/balance with dysfunctional patterns. Neurofeedback is the tow truck that pulls the car out of the mud. What Makes Neurofeedback MORE Effective? Temporarily removing potential gut irritants from the diet such as alcohol, caffeine, dairy, fried foods and refined sugar.